This Breast Cancer Awareness Month (October), generous companies are going pink with a purpose by becoming “Pink Patrons” for the Marie Keating Foundation. Marks & Spencer, Stella and Dot, Skechers Shoes at Shaws Department Stores nationwide, MAD flowers, Rain Natural Skincare and Harvey Norman are all helping to raise funds for the Marie Keating Foundation’s fight against breast cancer. 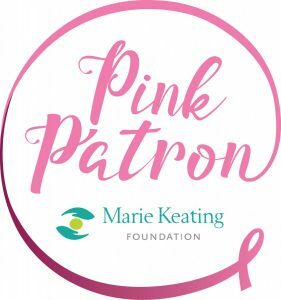 Funds raised from the “Pink Patron” campaign will help the Marie Keating Foundation to continue its services such as their mobile information units, which visit towns, schools, community centres and workplaces around Ireland and focuses on the importance of early detection of breast cancer. Funds will also help support the Foundation’s Positive Living programme, which provides support for the specific emotional and practical needs of people with metastatic cancer. During the month of October, the Foundation will be holding two metastatic breast cancer seminars. The first is being held on Friday 12th October in Smithfield in Dublin, in conjunction with Europa Donna. The second will take place in Munster later in the month. Harvey Norman: Harvey Norman have worked closely with one of their Irish suppliers to design and handcraft their 4,000pocket sprung (5ft), hypoallergenic “Marie” Mattress for their Sleep Pink fundraising campaign this October in aid of the Marie Keating Foundation. Harvey Norman will donate €100 for every “Marie” Mattress sold throughout September and October and it’s available in stores nationwide. Stella & Dot: Stella & Dot are bringing back a bestselling charity style in honour of Breast Cancer Awareness Month, the Tribute Bracelet (€29). A pave bar with rose gold finish anchors a delicate band of faceted hematite beads. 20% of all the sales of the Tribute bracelet in October will be donated to the Marie Keating Foundation. Available from www.stelladot.eu.